Still without plans to ring in 2018? 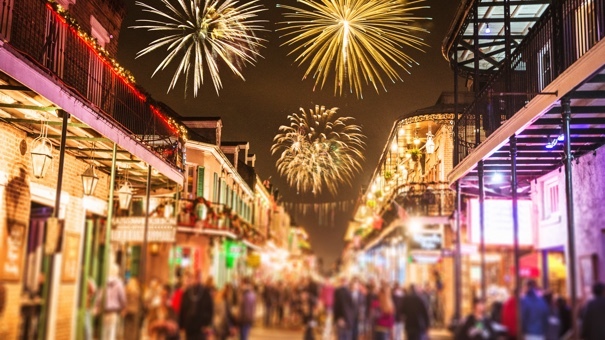 It's not too late to book a New Year's Eve getaway. You just need to know where to go. Get in gear for the New Year with these fab-but-affordable destinations that promise plenty of holiday cheer. Head south to enjoy temperate weather while you give 2017 the kiss-off with a stay at the ultra-stylish and super-chic Unscripted Durham Hotel, the rooms at which start at just $169/night for the holiday. 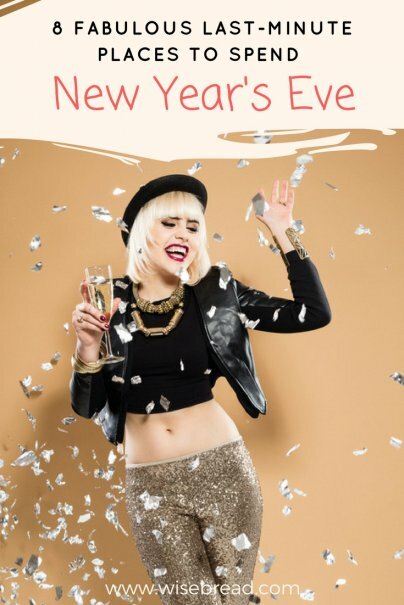 New Year's Eve festivities (tickets are $39-$49 per person) include entertainment in the rec-room-style lobby with Champagne and hors d'oeuvres; music by local DJ Guv'nor; and a tarot card reader who'll give you a sneak peek at what's ahead. During your stay, visit the on-premise all-day, a coffee shop/wine bar. Dodge the crowds and cozy up in the quaint town of Orange, Virginia, at the historic Holladay House Bed and Breakfast — it's nearly 190 years old — where you'll spend an elegant New Year's Eve just like our ancestors did. Well, sort of. Reservations will be made on your behalf at one of six local restaurants where you can enjoy a delicious dinner before watching the ball drop and tucking yourself in for a restful night's sleep. You can take your time in the morning since breakfast hours will be extended and checkout isn't until noon. If you plan a three-night stay, you can score 25 percent off the third night with code HOLIDAY25 at checkout, bringing the grand total to around $500. Pretty good price to crash just a few miles away from James and Dolley Madison's Montpelier home, which you should definitely visit while you're in town. Wanna get hygge with it? Pronounced hoo-guh, hygge is a Scandinavian concept that embodies coziness and contentment, and there's no better place to hand over the holiday reins in that regard than in the Twin Cities of Minneapolis and St. Paul, where you'll find hygge virtually everywhere. Sip hot cocoa at a ski lodge, bask in the glow of a fireplace at a bed-and-breakfast, snowshoe by candlelight, gaze upon the majestic Northern Lights, and thaw out at one of the local spas — all to your wallet's delight. In fact, many outdoor activities are free or inexpensive (11 state parks across Minnesota are hosting free, guided First Day Hikes to kick off 2018), and nearby resorts and lodges offer prime deals during winter months, including New Year's Eve. You won't need to buy tickets to a fancy party if you're spending the last night of 2017 in Sin City. Everybody pours out of the casinos onto the Strip to watch the choreographed fireworks display while throwin' a few back (sidewalk drinks are legal in Vegas, y'all! 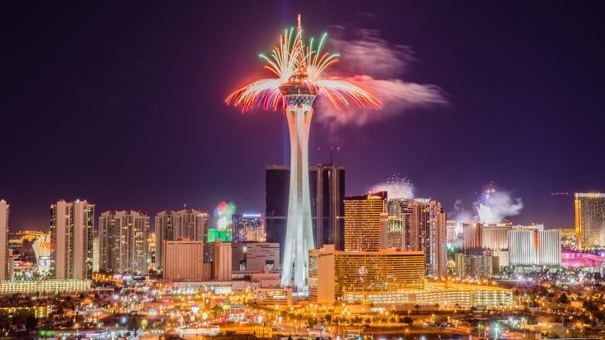 ), and you can score incredible deals like $163 a night at the 3.5-star rated Stratosphere hotel, available on value-hotel search site GoSeek.com. Bring a big group or plan a private New Year's getaway with your S.O. 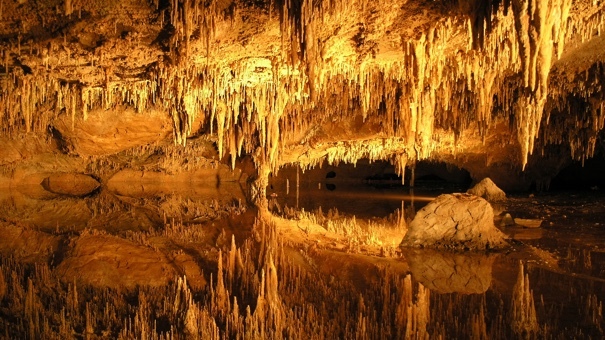 with the help of Allstar Lodging in the Shenandoah Valley, which offers rental cabins, cottages, and vacation homes close to lots of attractions, including Luray Caverns, George Washington National Forest, Shenandoah River State Park, and a wealth of outdoor activities, like hiking, horseback riding, snow skiing, and tubing. Couples can cop a comfy cabin starting at $125 per night, but if you make it a family or buddies' weekend rates can dip as low $50 per person for larger groups. The Papa Noel package at New Orleans' Windsor Court offers guests up to 20 percent off the best available rate (rates start at $188) from now to January 6. Guests can ring in 2018 at The Grill Room as its masterful culinary team presents a festive four-course meal to kick off the celebration. For $95 per person, plus tax and gratuity, guests can choose from delectable menu items such as poached lobster, rack of lamb, and cranberry bread pudding. After dinner, stop by the Polo Club Lounge to enjoy live jazz and a selection of fresh-start Champagne while watching the ball drop. 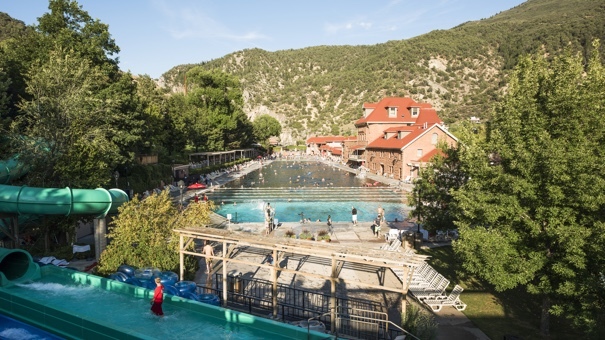 Make your New Year's festivities a wet-and-wild, budget-friendly family affair in Glenwood Springs, Colorado, where the Glenwood Springs Athletic Club will stay open until 1 a.m. to usher in 2018. The alcohol-free event will feature a handstand contest and ping-pong scramble at 7 p.m. followed by dive and cannonball contests at 8 p.m. Other activities will include a noodle relay, Marco Polo, crocodile wrestling (not with real crocodiles) and a friendly game of sharks and minnows. As the clock approaches midnight, pool staff will hand out party favors and noisemakers. Kids younger than age 12 ski free with the Ski, Swim, Stay package at Sunlight Mountain Resort; the bundle includes a lift ticket to Sunlight Mountain resort, admission to the world-famous Glenwood Hot Springs pool, and overnight accommodations at one of the participating lodges in town where offers start as low as $99 per night. You won't have to lift a finger during your stay at the peaceful Serenity Springs woodland oasis, which — for about $600 total for the weekend — includes a full-service stay in a secluded cabin. Amenities include a butler door with light switches that indicate when service has been delivered to your cabin (food, fun surprises); carriage rides, which are available to and from your cabin upon check-in and check-out, and for any other outings you'd like to take; heated floors; fireplaces; in-cabin massages; candlelit dinners in your cabin with food from local restaurants; and personal outdoor fire pits for getting all snuggly under the covers.